I have no idea how I got here. I’m 35 years old and as long as I remember I have hated school. Somehow, here I am educating myself in Gradia Jämsä and hope to graduate next spring with a vocational qualification in business and administration. When I started this school, I was thrilled to have learned that they have exchange programs for adult students as well. I applied immediately. Now here I am getting ready to leave at Saturday 2 in the morning to catch a bus to Helsinki-Vantaa airport. 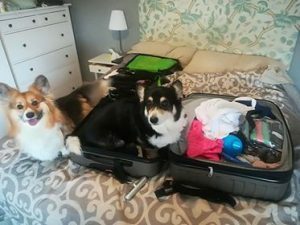 First, I do have to say goodbye to my loving husband and 2 corgis, I only wish I could take them with me, but this is something I’ve got to do by myself. I’m going there to enrich my studies in office services in Chichester College, Business Department in United Kingdom and in a nutshell, I would be doing office work (document management, electronic and written communication, telephone services, creating, maintaining and editing registries, statistics and reports etc.). I’m excited and terrified at the same time, because this type of work is something I know I can do, but can I really do it in a different language? I know I can communicate in English rather well and hold conversations about everyday life, but I have no idea about the vocabulary in the office, (hardly even in Finnish)! So, I ordered this book; “Business First” and I was hoping to get it before I go, so that I could read it on the way there, but it hasn’t arrived yet! Now my dear hubby must send it to me. But hopefully people there will understand and hopefully I’ll learn quick, at least that’s what I keep telling myself. So yes, it’s safe to say I’m scared, but I saw this episode in Grey’s Anatomy where they talked about this scientific study which showed that if you stand in the superhero pose for 5 minutes before a job interview, presentation or difficulty task, you will not only feel more confident, but you will perform measurably better. Don’t know how much that is accurate but that’s something I’m going to do to achieve this thing. Now I do have some expectations towards the Brits, I love them. I have visited before, mainly in London so I’m glad that I got this chance to go somewhere else. Chichester is in Southern England and not too far from the coastline, I can’t wait to explore the city and its nearby towns as well. I have already done some exploring on the Internet and I know I want to go and see this Kingley Vale National Nature Reserve and as soon as I go there, I will blog about it. It looks amazing in the pictures, so I do have some high hopes. I chose to stay in homestay during my 8-week internship instead of staying in a dorm because, first there is a good chance that the host family has a pet (I actually requested a home with animals) and second, I think this way I get to see closer the different culture and speak English even more. I’m going to write this blog once a week and let you know how things are, hopefully you will come and read it and get to be a part of this journey with me.